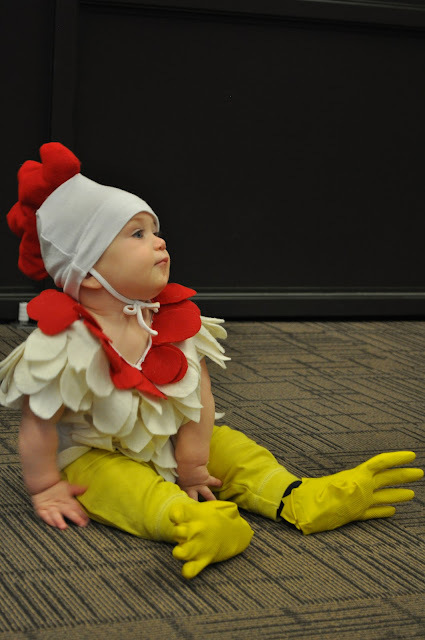 Here’s the scoop: Benjamin thought his original costume, the one with real feathers, was just about the best thing in the entire world. It short, he was well on his way to plucking himself into one very naked little chicken. He managed to de-feather about half his costume in the space of about 20 minutes. The living room looked like a feather snow storm had blown through. The darn thing was also impossible to get off. So I turned what was left of Ben’s feather boa into a costume for Bailey and then sewed felt ‘feathers’ onto his onsie. Not as chickenish as the original but it worked. 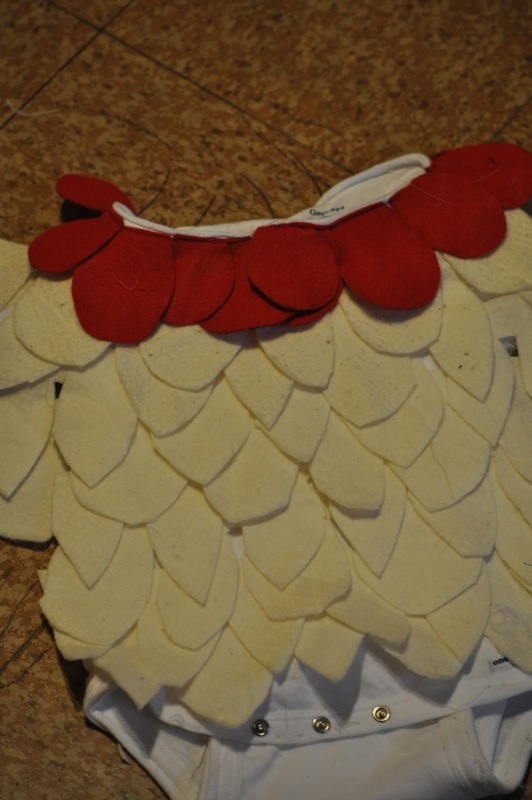 I made a template out of paper first and then cut out rows of feathers so I didn’t have to sew each one on individually. Then it was a simple matter to layer them onto the outfit, starting at the bottom and working my way up. The red collar was an element that was left over from the original feather costume. In case you’re wondering, the costume was fairly easy to create: red and cream felt, a white hat, onsie, pants that I dyed bright yellow, and rubber gloves [stuffed with foam] over shoes.